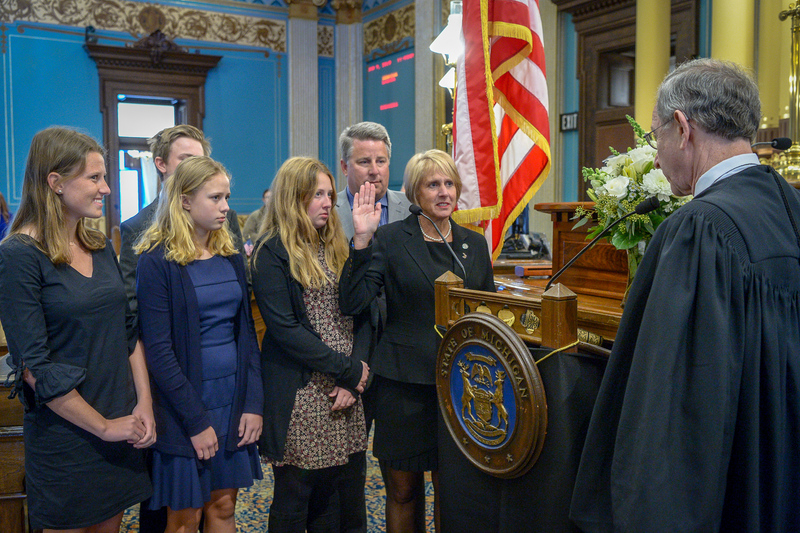 LANSING, Mich. – State Senator Kim LaSata was sworn in as Senator of the 21st district on Wednesday during a ceremony at the state Capitol. Michigan Supreme Court Chief Justice Stephen Markman administered the oath of office. LaSata was joined in the Senate chamber by her husband, Judge Charles LaSata, her children, Sarah, Anna, Chas and Claire, and Jared Hannapel, for the occasion. LaSata’s office is S-310 of the State Capitol in Lansing. Residents may contact LaSata by phone at 517-373-6960, by email at SenKLaSata@senate.michigan.gov, or via U.S. mail by writing to Sen. Kim LaSata, P. O. Box 30036, Lansing, MI 48909. Photo caption: State Senator Kim LaSata, R-Bainbrige Twp., was sworn in as Senator of the 21st district on Wednesday, Jan. 9, 2019 during a ceremony at the state Capitol. Pictured with LaSata is her family and Michigan Supreme Court Chief Justice Stephen Markman, who administered the oath of office.